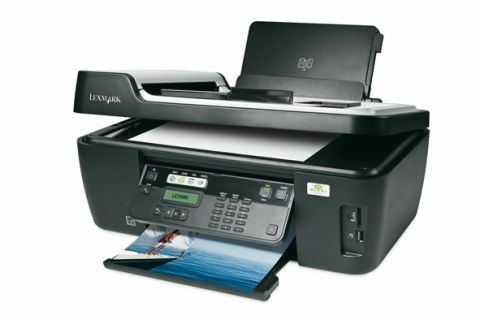 A very compelling printer, but the price means the feature list isn't quite as full as it could be. Along with HP, Lexmark stuck with the old-fashioned system of tri-colour cartridges with built-in print heads longer than most manufacturers. But we all resented throwing away expensive ink just because one of the three chambers had run dry, so fixed print heads and individually replaceable ink cartridges, which are little more than basic ink tanks, are the new order of the day. The Interpret S405 joins the previously reviewed Lexmark Interact S605 in serving up Lexmark's new Vizix individual ink system, more along the lines of the Canon MP640. But whereas most 'all-in-one' printers come up short in office-minded features, the S405 aims to give you everything you need. Whereas the fun-loving and flamboyant Lexmark Interact S605 is based around 10.9cm full-colour touch-screen, the cheaper S405 has a more hard-nosed businesslike mono LCD for just two short lines of alpha-numeric characters. This makes it less than ideal for printing photos direct from memory cards, since you can't preview them, although printing is still possible using the USB input socket which can read memory sticks or connect with PictBridge-enabled cameras, or from the single memory card slot which works with SD, MMC, Memory Stick and xD cards. Even so, with only four inks under the bonnet, photo quality is merely good, rather than fabulous, as colour space is slightly lacking. Where the S405 really hits its stride is in office duties and, unlike the S605, it adds a 35-sheet ADF (Auto Document Feeder) for scanning, which makes short work of multi-page documents. Moreover, the ADF teams up perfectly with the built-in fax machine, also lacking on the S605, so you can make mono or colour photocopies, print and send or receive faxes even when your computer is switched off. Having the right connections is vital in business and the S405 doesn't disappoint. As well as the usual USB 2.0 port for connection to a standalone computer, there's Ethernet for hooking up with a home or small business network and, even more important nowadays, full Wi-Fi connectivity. This is particularly good for printing from your laptop, anywhere around the home. The S405 is no slouch when it comes to print speeds. In our tests, it outputted mono text pages in seven seconds flat and colour DTP pages in just under 20 seconds. Switch to photo output and you'll get a regular quality 6x4 print in about 30 seconds. The only real fly in the ointment is that the standard capacity cartridges supplied with the printer last no time at all, but page yield and running costs are average if you switch to Lexmark's XL high capacity cartridges.